".. are better than one" according to the classic song from The River album. You know what else is good? Two hands. 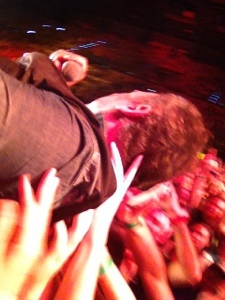 When Bruce Springsteen is crowd surfing towards you, and you're one of just a few people between him and the stage, use BOTH hands to support him. Because holding his back up with your left arm while you try and take a picture with your right arm ends with guitarist Nils Lofgren having to rush and help Springsteen when he's about to land awkwardly.